Aberdeen City Council has performed an 11th hour U-turn on plans to make every cab in the city wheelchair accessible. The licensing committee yesterday decided to review the policy that every Granite City taxi needs to be wheelchair accessible by the proposed final implementation date of June 6, 2018. It was expected the proposals would be passed, but now the council’s head of legal and democratic services has been asked to produce a report detailing the legal and financial implications of a change to the policy. The report will go before the licensing committee on September 12. The motion, which was unanimously approved, was put forward by the committee convener John Reynolds. 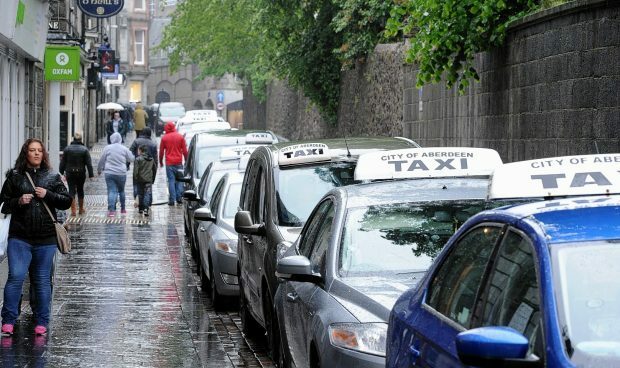 Plans were first approved in 1994 to make every cab in Aberdeen disabled-friendly, with the council arguing that they were under a legal obligation. However the UK Government has said that they are “not implementing mandatory rules”. Aberdeen has since run a mixed taxi fleet and wheelchair accessible vehicles make up around 50% of the fleet. Unite the Union’s regional officer, Tommy Campbell, who spoke at the committee meeting, is in favour of a review and believes that having a “100% accessible fleet” is unnecessary. He said: “We believe that the council should be evidence led on the issue of what the demand is. otherwise, are demanding that all the taxi fleet should be 100% wheelchair accessible. “Over half the fleet is wheelchair accessible now. that they were unable to get a wheelchair accessible vehicle. Tom Wilson, a taxi driver and secretary of the Wheelchair Action Group, supports the proposals because he believes they are “fair” to all taxi drivers. He said: “I’m in favour of any policy that is fair to every driver and if the policy is 100% wheelchair then that’s fine. “They have a 100% policy in Manchester, London, Birmingham and Bradford, they are all bigger cities than Aberdeen and they can make it work. “The council should have contacted these cities to see how their policy works. Another driver, John Leaper said: “The council have already delayed the proposals before, why do they want to do it again?